View More In Salt & Pepper Shaker Sets. Do you remember the fresh smell of spices from your mum`s or grandmum's kitchen? You can have it now, too, as here is Best cooks friends salt and pepper grinder set for you! Why to buy Best cooks friends Salt and pepper shakers ? - Use only the best; trust our 5-stars reviews. Mills are made of clean glass jars, brushed Stainless steel and strong Ceramic grinding core. Long lasting materials that won't get the color or the smell of the spices and will keep your grinders in best condition for a long time. - Keep the decisions in your hands; adjust the pepper grinder mechanism on mill grinder to get the fineness you prefer! Please note: Salt pepper grinder set does not come filled with spices; you're free to choose your own spices. - It won't live You in a mess; as pepper mill grinder sit upright, they will never leave the spices on your table. 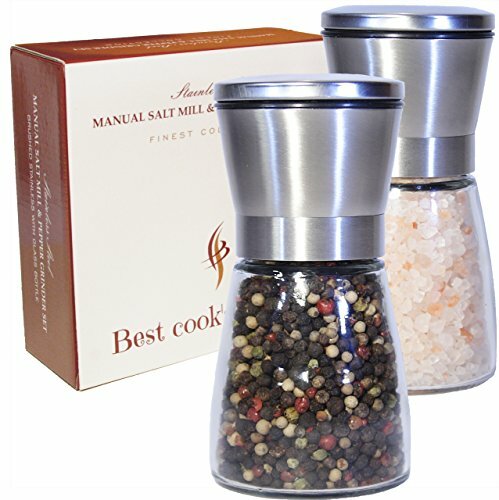 - Always available; manual operation salt pepper set, no batteries required. Simply turn the top section of peppercorn grinder to grind Himalayan or Sea Salt, peppercorn or other spices. - You will get this wonderful set of salt pepper shakers novelty in a luxury gift box to gift and impress you and your friends on a visit, for birthday, wedding, move-in, on barbecue, to give best friend gifts, or any other occasion. 90 DAY WARRANTY: Best cook's friends Salt and pepper grinder set purchased from Best cooks friends come with a 90 day money back guarantee. If you're not happy with the product for any reason, simply return it for a full refund. . This original manufacturer's warranty applies only to purchases made from Best cooks friends, and no other sellers. Buy your best grinder set Now to have available for your next meal. ENJOY FRESH GROUNDED SPICES by Best cooks friends salt and pepper shakers. EASY TO USE pepper mill and salt grinder for fresh seasoning. ADJUSTABLE FINENESS - just turn the black knob on the top of grinders. BECOME HEALTHY AND TASTY MEALS CHEF! Use your new salt shaker or pepper grinder for sea salt or Hymalain pink salt or other spices. Glass jar and ceramic grinding mechanism are NON-CORROSIVE and EASY TO CLEAN. Please note: SALT N PEPPER ARE NOT INCLUDED! IMPRESS WITH YOUR NEW SALT PEPPER SHAKERS OR YOUR MONEY BACK! You just keep your salt pepper grinder set on your counter! Grinder set is safely stored in a GIFT BOX. Buy with confidence! 100% money back guarantee! EASY REFILL, WITH NO MESS. Salt mill is 5 inches tall and holds 3/4 cup. Clear jars will tell you when to refill. Stainless steel top easily screws off THE WIDE OPENING. GRINDING MECHANISMS ARE ON THE TOP, so spices end up only on your food. ALL AROUND PROTECTION: There is no risk for you, knowing that NO MATTER WHAT, WE'VE GOT YOUR BACK! Whether you need a replacement for your mill grinder or it just isn't working out, send it back our way and we'll either find what you need, or refund your money. If you have any questions about this product by Best cooks friends, contact us by completing and submitting the form below. If you are looking for a specif part number, please include it with your message.